Captain Tommy Robinson is one of Florida’s most respected and sought after saltwater guides. Tommy and Kathy opened Robinson Real Estate Company in 2006. Their real estate clients include many of the great folks that have fished with Tommy and Kathy for years and their territory covers the portion of the Florida Panhandle locally referred to as “The Forgotten Coast” or from Mexico Beach to Alligator Point and Key West, Florida. Two hours south of Florida’s capital city is Apalachicola, the sparkling jewel of Florida’s Forgotten Coast. With wide-porched old Florida style inns and restaurants offering all the oysters and Gulf shrimp you can eat, this sleepy town of 3500 offers nothing less (and nothing more) than the light tackle/fly fishing paradise you’ve been looking for. 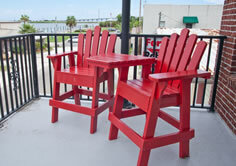 St. George Island, just across Apalachicola Bay, is a favorite vacation spot. Beachfront homes on the island offer great investment opportunities. The communities of Carrabelle, Port St. Joe and Eastpoint offer great real estate opportunities as well. This is a great place to visit, and an even better place to live! More about Apalachicola, Florida. Key West is just a short and picturesque drive from Miami, Florida down US-1. The Florida Keys hold a lot of treasures for the traveler. The islands offer a tropical blend of azure waters, tropical foliage, fine dining with fresh seafood available daily, and accommodations for any budget, some with a history of notorious and notable figures. 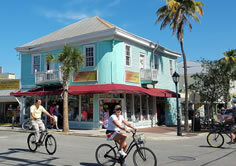 The laid back lifestyle, southern charm and Caribbean flavor are what make Key West what it is today. Figures throughout history have visited Key West, some making it their permanent home for a while, others enjoying the tropical climate while they escape the harsh winter. The sun drenched hospitality of our island will charm you. It has already made more than one million people come back and visit each year. More about Key West, Florida.